Rhode Island’s Latino Artists Get a Place of Their Own | RI Latino Arts • Blog • ¿Qué Pasa? CRANSTON, R.I. -- Tamara Diaz stands between two paintings from very different periods in her life. One painting, called "Exposed," from 2008, depicts a woman opened up at the center, with her core exposed to reveal a complicated labyrinth of images - a small child, a house, all nestled in twists and turns that look like stylized ribs or a digestive system. Deep plum-colored tentacles splay out from her neck, which is adorned with a delicate beaded necklace, and the woman's outstretched hands hold bags: on one side, a palm tree on an island, on the other, an image of the Virgin Mary. "I didn't feel very human when I painted that, and maybe I was morphing into something otherworldly," says Diaz. "This is from a time in my life when I had been married and then broke up with my partner." Diaz's brightly colored pop-art painting is reminiscent of New York City graffiti artist Keith Haring, who used two-dimensional shapes defined by strong, flowing black lines. But Diaz brings bright colors and a strong Latino influence to create an explosion of color full of emotion, symbolism and imagery. "I freestyle everything I do, and much of it is very emotional," says Diaz. Diaz's work is being shown with that of other Latino artists at the new La Galería del Pueblo, in Pawtuxet Village, Cranston. The gallery, which opened earlier this month, is the work of Rhode Island Latino Arts, a nonprofit organization dedicated to preserving the art, history, heritage and cultures of Latino communities in Rhode Island. Other local Latino artists whose work is currently on display are painter Félix Dicló, painter and illustrator Atabey Sánchez and book illustrator Christina Rodríguez. 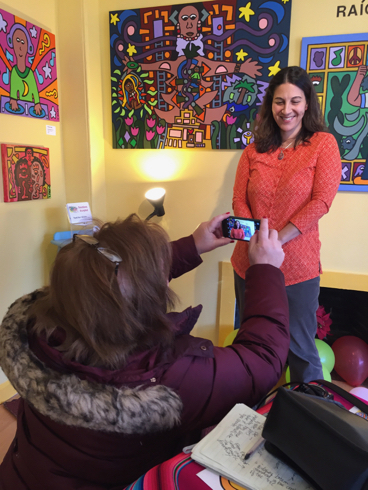 "We needed a home and a place where we could meet and share ideas; we needed a community meeting place," says Marta V. Martinez, executive director of Rhode Island Latino Arts. Martinez began the Hispanic Heritage Committee of Rhode Island in the late 1980s, which led to Hispanic Heritage Month celebrations. Through her work, she discovered that there was a rich and vibrant Latino artist community in Rhode Island, yet they did not have a place to meet and critique each other's work, conduct workshops and provide support to their fellow artists. "That's what inspired me here - if we can get that kind of dialogue going in this space, it will be great," says Martinez. "The gallery is going to shape itself as time goes on." The gallery is a small place with big plans. "We want to have workshops, spoken-word readings, children's programs and even discussions on things that impact our community. We are planning a discussion about Fidel Castro - no agenda, just a get-together to talk," says Martinez. The group plans to partner with its Pawtuxet Village neighbor, the Elephant Room, for music and entertainment following its Friday night programs. "Musicians will come in here and play, and then we'll all walk over. Fridays will be Latino night in Pawtuxet Village," says Martinez. "That's one of the things I've missed," says Diaz. "I used to love to get together with all of my friends and play music, have a bite to eat and talk about art. It reminded me of the Picasso days, where people from all over would meet and talk about art." Diaz, who is a clinical therapist in Providence, uses art therapies to help adults and children who have experienced trauma. Diaz is from New York but lived for several years in Barcelona, Spain, as a child. It was there that she developed her appreciation for the rich, saturated colors and fantastic themes used by renowned Spanish architect Antoni Gaudi. Diaz attended Roger Williams University as an undergrad and then Rhode Island College for her master's degree in social work. "My dream has been to return to my father's homeland in Cuba," says Diaz. "My father and his family were Cuban exiles who came to America in 1962 with only their dreams. It's why you see that imagery symbolized in many of my pieces." In "Exposed," the outstretched hands hold bags that appear to keep the woman balanced. "The palm tree on the island is my symbol for Cuba," Diaz says. "It's in a bag, almost like I am carrying emotional baggage. On the other side is a bag as well, but it carries our Lady of Guadalupe, who protects me." Diaz pivots to the adjacent painting, done four years after "Exposed." "This one is a little different," she says. This painting depicts a woman standing strong with arms raised in a flexing stance. The woman is smiling and is surrounded by a border of brightly colored rectangles with images ranging from flowers to drums and palm trees. "I had just gone to the Occupy rally downtown and felt a little pumped in my energy," Diaz said of the creative process that led to the painting. Each design element tells part of the story. "I had seven exhibits I was preparing for all at once. These rectangles symbolize all of the art that's everywhere, and all of the influences and symbols of my life," says Diaz. "Like the other artists in our community, these are the things that surround me and make me strong." Much like the hub of activity that Martinez has created at the gallery. "That's our mission," said Martinez. "We are here to be a community of artists." - Liz Klinkenberg is a frequent contributor to The Providence Journal. She can be reached at rifeedsri@gmail.com.